Your Dentist in Crookston has a New Office! Drs. Jaclyn Jensen and Tiara Applequist and their team at Renu Dental Care would like to welcome you to our new office! We are now located at 2211 Sahlstrom Drive, Suite A in Crookston. And while we may be in a new office, you’ll still find the same comprehensive and professional dental services are provided for you and your family. Read on to learn more about the dentistry we offer. In keeping with the recommendation of the American Dental Association, your Crookston dentist would like to see you at least twice each year for preventive dental checkups. At these regularly scheduled visits, the dental hygienist will clean each tooth individually, taking care to remove plaque and bits of tartar (hardened plaque), which can discolor your smile and eventually lead to gum disease. We’ll also visually examine your teeth and probe those tiny crevices to find soft spots that often indicate the beginning of a cavity. The dentist will also check the condition of your teeth to see if you’re grinding or clenching and conduct an oral cancer screening. Why take your kids to another dentist when the whole family can have their smiles taken care of at Renu Dental Care’s new office? 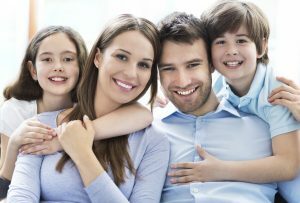 Dr. Jensen and Dr. Applequist love seeing children, and both dentists have a friendly and warm demeanor that kids enjoy. Our goal is not only to help your children have healthy teeth and gums, but also to teach them the value of dental care for a lifetime. If we find a tooth that needs repair, then chances are we offer the appropriate treatment right here in our office. The most common restorative service we provide is a tooth-colored filling. Your teeth are constantly exposed to oral bacteria and the acids they produce. A cavity happens when these acids dissolve the enamel coating on a tooth, causing a small hole to develop. With a tooth-colored filling, your dentist can repair the hole with composite resin material that perfectly matches the color of your tooth. In addition, the material is quite strong and bonds directly to the remaining tooth structure. Dentistry today isn’t only about maintaining your oral and dental health. We also want to see you enjoy the benefits of a beautiful smile. Come in and have your teeth professionally whitened or correct imperfections with porcelain veneers. We even offer Botox treatments to smooth lines and wrinkles around your smile. Call for an Appointment in Our New Office! If you need to schedule an appointment, contact Renu Dental Care today! You’ll find us in a new location, but the treatment and service is the same high quality. Comments Off on Your Dentist in Crookston has a New Office!